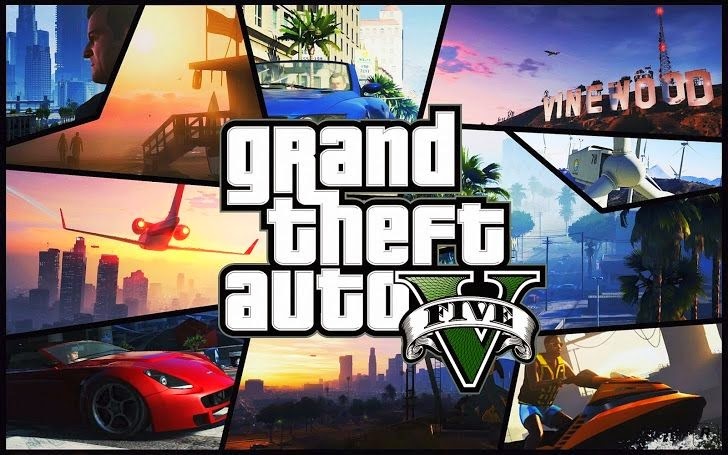 Since all the versions of the popular game ‘Grand Theft’ gone blatant and during the first week of the release of the Grand Theft Auto 4 in 2008, it topped half of millions of dollars, sold 3.6 million copies and generated $310 million in sales i.e., earning about 5 times as much as the blockbuster movie - Iron Man. But the latest version -- Grand Theft Auto V is only available for the Xbox 360 and PS3 and there are rumors of a PC version of it on GameStop's PowerUp Rewards website. So, it’s very common that if I offer you Grand Theft Auto V for PC, you eagerly want it. Mind this, "There is no Grand Theft Auto V for PC," accept the reality and don’t let cyber criminals take leverage of this fact. If you receive any email that alerts that you have been invited to the PC beta test for the game, considering it unreal, don’t click on embedded links in the email because it can lead you to several bad websites that will infect you with all kinds of malware, according to Antivirus firm Trend Micro. "The uncertainty did not stop cybercriminals from taking advantage of the pre-release publicity," warned Trend Micro Friday. "We recently found a spam campaign making the rounds; this one claims that the user has been invited to the GTA V PC beta test." 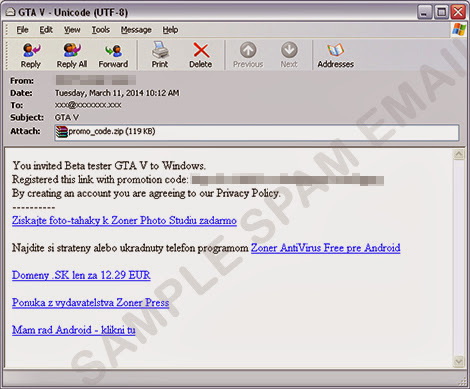 The second half are links in the email written in Slovak that may lead you to several sites, one of which is a phishing site; it also contains a zipped attachment containing an application that masquerade to be an access code, but is actually a known backdoor Trojan detected as BKDR_ANDROM.ATG, that can serve as another vehicle to infect your computer. "In the past, we have reported several spam attacks that banked on the success and popularity of online games in order to proliferate malware. Games like World of Warcraft and Grand Theft Auto IV were also leveraged before by spammers," Trend Micro wrote in its Threat Encyclopedia. "Clearly, the worldwide success of these games makes it a good social engineering lure to trick users. In this specific case, spammers capitalized on the much-anticipated release date of Grand Theft Auto V on PC, Xbox One, and PS4." The cyber criminals are very smart for having a proper grip on the people’s intentions and by disguising themselves as the popular game, popular websites in order to spread malware to the victims’ computer or in some cases successfully able to fetch financial details of victims. We also had aware you about many such incidences in which cyber criminals are taking advantage of the popular gaming apps, like we previously informed about the Flappy Bird gaming app which infected number of users. So, it is advised you to do not click any link precipitately that seems too good to be true and always be careful and alert when it comes to spammed mails such as those which do not exist at all in reality.